See previous 2 posts for all of my inner monologue (no need to bore again). While the past two had more of an Asian and Thai flavor, this recipe is my first foray into Mexican food since starting weight watchers. The one BIG change I would make to this recipe is to drastically reduce the taco seasoning (which is reflected in the recipe I’m posting). I used an entire packet of taco seasoning since that is what I use when I make meatless tacos. This proved to be WAY too salty for the shrimp and was very over powering. This was definitely not one of my cooking highlights but it had potential. 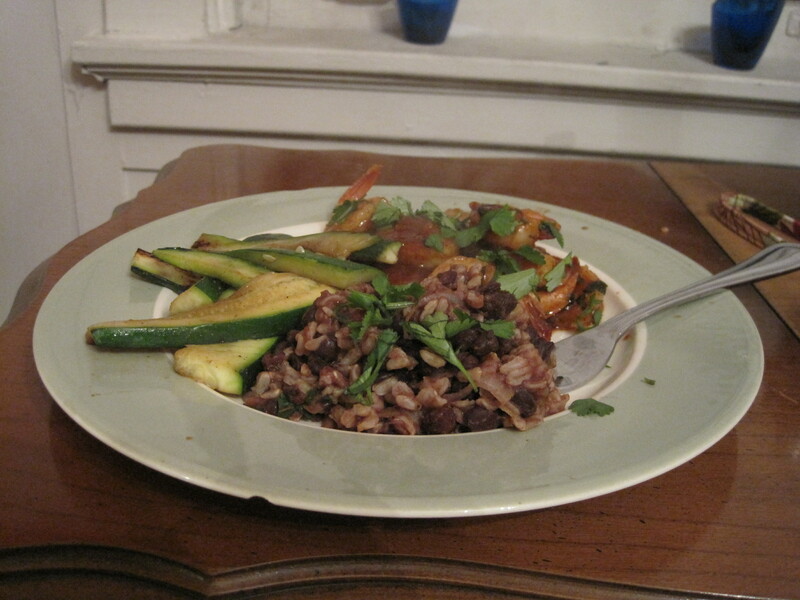 The rice and beans were surprisingly really good and if the shrimp were less salty they would also be very good. I’m including the recipe with a reduced taco seasoning amount but it still may be too salty for some people’s tastes. I kept it with the taco seasoning since, frankly, it’s the easiest and quickest way to season. I would recommend instead replacing the taco seasoning with some taco sauce (say 1/4-1/2 cup), cumin (I’d do approx 1 tbsp), cayenne red pepper (I would do approximately 1/2 tsp), salt (to taste), and some pepper (to taste). Good luck and enjoy! Saute onions and cilantro in broth. When onions are soft, add shrimp. Add approximately 3/4 cup of water and then add the taco seasoning. Heat on medium heat or until sauce is thick. Add vegetable broth, onions, and cilantro to pot. Cook until onions are soft. Add beans, cumin, and rice. Cover and heat through.